I am using biblatex for citations and bibliography. 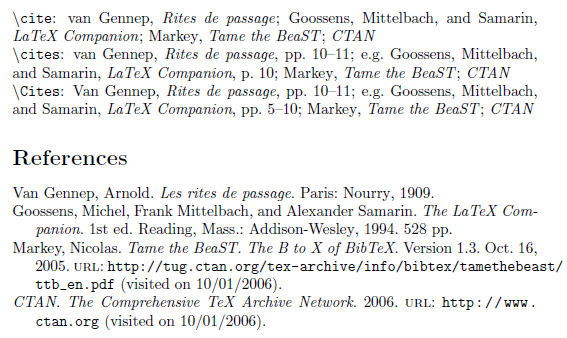 Now I often have lists of multiple citations, for which biblatex has the \cites command. Now I can get citations to automatically sort if I don't want page numbers, but I cannot get it right with page numbers. What I want is all citation ordered chronological (oldest first). Is this possible, or must I just do this by hand? Edited (2018-07-14) by moewe for biblatex >= v3.8. See the edit history for older biblatex versions. The multicite commands take arbitrarily many arguments. They aren't designed to output a sorted citation list. It is possible to construct a two-pass version of \cites that will generate a sorted, qualified citation list. A tidy resolution will probably warrant extension of biblatex internals. This is something we should consider as \textcites in the verbose styles suffers from the same limitation. Is it possible to have an enhanced version of the singletitle option?